Let's recap what we know for sure: Monday hit my anticipated target perfectly, and there are now five waves down on the S&P 500 (SPX), which satisfies the minimum expectation for Minute Wave-i -- as such, the larger expected wave-ii rally might be underway. After Minute Wave ii completes, it is expected that Minute Wave iii-down will travel beneath the 1266 swing low. Ultimately, the larger degree Minor Wave (iii) should travel into the 1100's. If the rally is Wave (4), will Wave (5)-down extend and blow through the lower target zone? I'm favoring the idea that this corrective rally has about run its course, that it's Minute Wave (4), and that the market will make a new low beneath 1309. I'm split on the idea of an extended fifth wave here, and there's really no way for me to know in advance. For the intermediate term, I strongly suspect that Minor third wave down is now underway, but the caveat is that the market needs to confirm with a print beneath 1306.62. 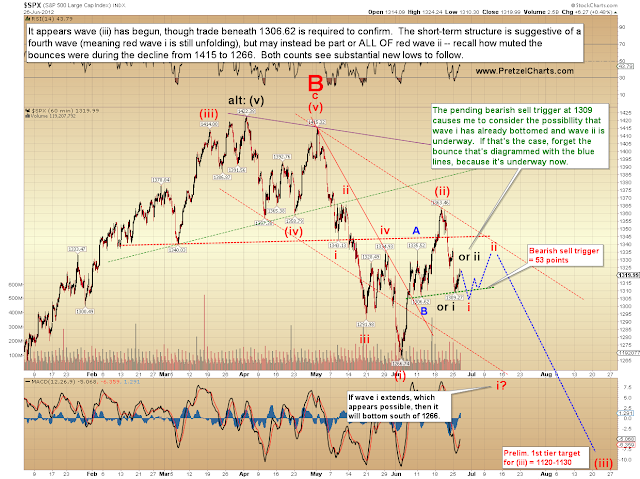 So, third wave declines require the majority to head into them positioned long. Here's the funny thing about sentiment: I suspect that the majority of people wouldn't really believe my projections, because if they did, then we couldn't have an extended decline. People who think the market is headed significantly lower aren't holding equities; they are either short or flat. And people who are short or flat have nothing to sell to drive the market lower in the first place -- so if I'm right, the majority are still long right now: it's something of a requirement. 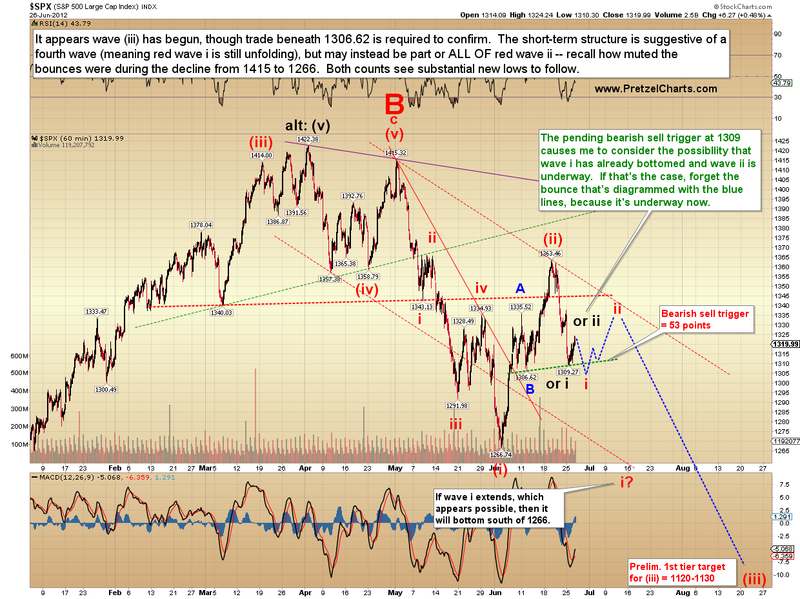 Right around the time the majority turn bearish, it will be time for a large bounce. Let's move onto the charts, and take a quick look at the intermediate picture. The questions I outlined above are reflected on this chart (as well as the next one). If Minute ii-up is underway, then just move all the blue lines over to the left. 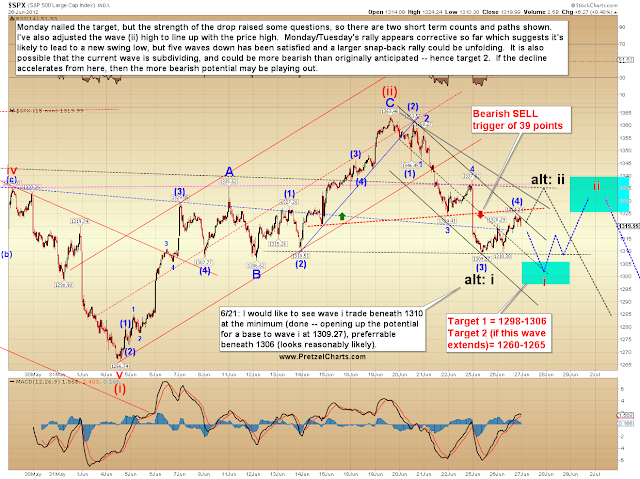 Next, the short-term chart, and the expectations of the wave (4) count. After re-examining the first stage of the decline, I have moved the Minor (ii) high to match the price high at 1363. I now suspect that the move from 1363 to 1346 was, in fact, the first wave... though it looks a bit odd because it had an extended fifth. This also matches the strength of the recent decline into the 1309 low, since that would still be a portion of the Minuette wave (3). The alternate black count may or may not have more rally left in it. If the market does more than a very marginal new high, suspect the black wave ii count. Conversely, if the move starts to accelerate lower from here, suspect either the extended fifth or the alternate count, and we should start looking for lower targets. If this is a standard fifth wave decline, it should make a new price low, but there should be numerous bullish divergences on the indicators when it does. In conclusion, the short-term was dead-on clear last week and I hit the last 3 turns almost to the penny, but things just aren't always that clear, unfortunately, and the short term is now a bit hazy. It will clarify again soon enough. Regardless of the market's short-term path, the intermediate term appears decidely bearish. Trade safe. PL, somehow I cant login via Mobil device into my deep wave account, so I post it here: what "bothers" me is the absolute lack and decrease in volume of this rally. SPX traded only 2.3B shares and SPY for example a little under 108M today. That is 36% less than average... This tells me the big boys ain't buying, since they have way more ammo (volume). Ever since the early June low volume had decreased and is now drying up. No buying volume means no price increase... This can go on of course for a while, but shows the end is near IMHO, unless something really dramatic happens! ?